Objective: As part of an ongoing strategy to generate overall awareness for Del Taco, Powerhouse Communications was tasked with driving trials of the brand’s menu items featuring its seasoned turkey. Challenge: Due to limited timing of the turkey promotion, Powerhouse was responsible for securing optimal reach and engagement while ensuring quality content in a two week span. 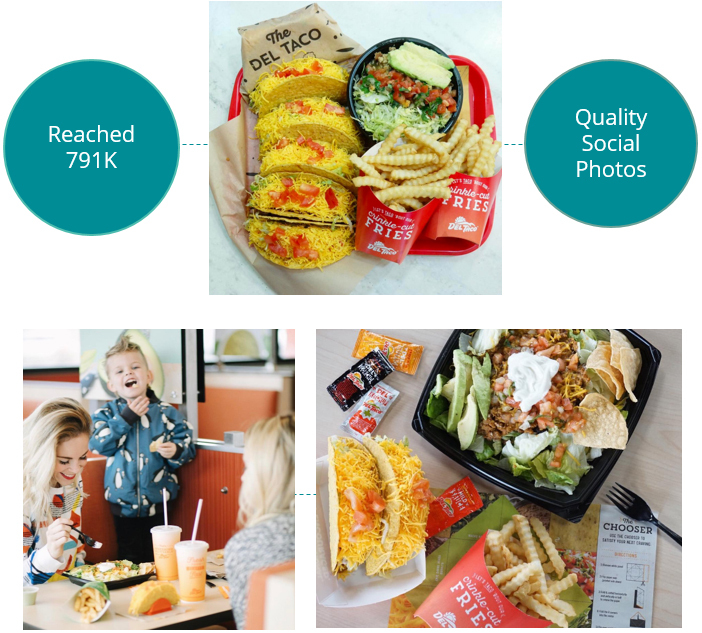 With Del Taco restaurants located throughout the country, the agency also had to spread a small budget across multiple markets to maximize exposure. Solution: Along with traditional media outreach, Powerhouse harnessed the power of social media to generate buzz by coordinating sponsored posts with micro-influencers based throughout the nation. Through extensive research and Instagram analytics, the agency was able to identify the best social influencers to work with to reach the brand’s target audience. In addition to outreach, Agency handled all aspects of the coordination process from store visits and influencer payment to brand guidelines and content approval. Results: In the two week time period, Powerhouse successfully secured partnerships with a small group of reputable micro-influencers in different key markets, all within the Client approved budget. In addition to managing the creation of this high quality, reusable content and garnering more than 700K impressions, the Agency was also able to nurture relationships for the brand with media in outside markets, creating more opportunities of coverage for future promotions.